Amazing Royal Caribbean Cruise Galveston Texas. 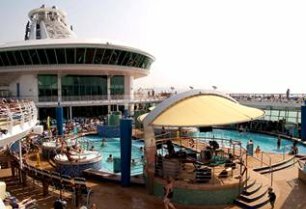 Experience the world of the floating hotel-The Royal Caribbean Cruise Galveston. Cruises from Galveston on the Voyager of the Seas are unforgettable. Voyager exhibits a vast range of facilities that make tourists on Galveston cruise vacation feel at home. 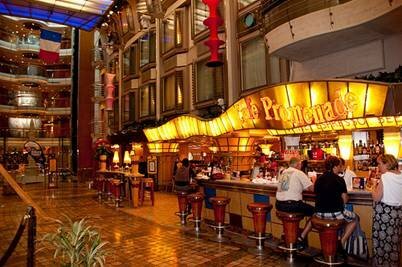 The ship has the ability to entertain over 3000 people on board to the maximum capacity. The photos below show some of the most prominent spots on the Voyager. Shoppers Paradise -The Grand Promenade, is filled with shops and cafes. 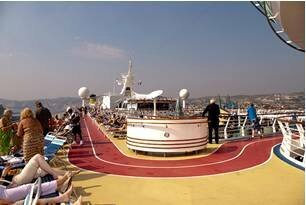 The cruise has many swimming pools including children, adult and thallasotherapy pool inside the spa. 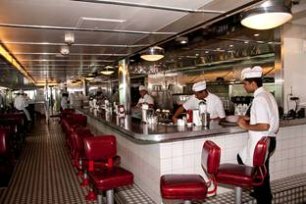 Another great location to stop-by is the Johnny Rockets Burger Bar of 1950 style. 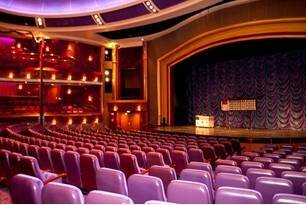 A 1500 seat Scalla Theater features cultural shows and concerts that could rival major theatrical events. 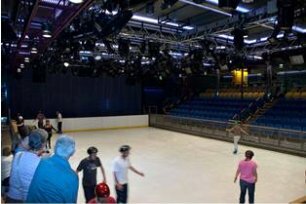 Imagine ice skating in the gorgeous Royal Caribbean cruise ship? A running course is available for joggers. A five lap on the course will equal a mile. 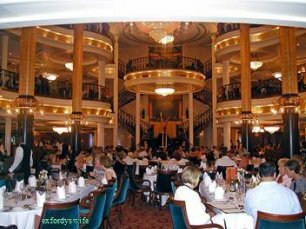 A relaxing formal dining hall appeals to many on board the ship. 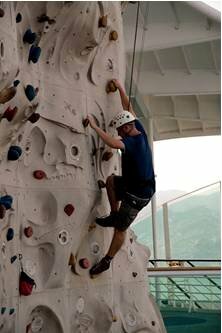 The Rock climbing wall located on Deck 14. A compelling state of the art sport facility that dares the adventurous tourists. Other amenities include Themed bars and lounges, Day spa and Fitness Center, Wedding chapel, Library, "Optix" Teen Club,Inline skating, miniature golf course, Golf simulators, basketball court etc.